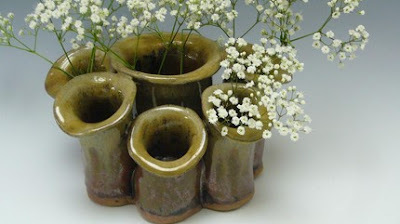 Liz Gamelin of Mountain Home Pottery found her passion for working in clay after being a florist for many years. Her home and her source of inspiration is the beautiful Ozark region of Arkansas. She makes dipping dishes, bowls and baskets that resemble the trees of her mountain home. The earthy pallette of her work speaks of the natural world. 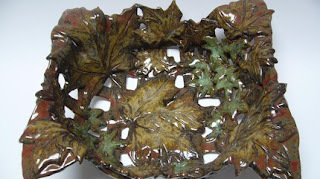 Liz says of her work "It is very exciting to take a piece of clay and work it and shape it. In this process the clay responds in its own way, and my idea and the clay's inclination, have merged into something even better than the original intent. Add to that the application of glazes and firing the piece. Adding the fire to the equation allows beautiful, unexpected things to happen. That is why each piece I make is unique. They will relate to each other in similar shape and colors, but no two are the same." 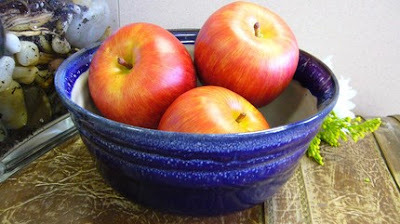 Visit Mountain Home Pottery at their Mountain Home, Arkansas store, on Etsy, or at Mountain Home Floral. Thank you for spotlighting me on your blog. It was a very nice surprise! You are so welcome Liz. Your work is beautiful and I loved sharing it. I love your work also Liz. I have many uses for your "Bubble Bowls".